Click the above link to see our Timberland video shot in June 2012 on our design trip to the factory in India. An inspiring event at the beautiful venue of the Ambassadors Residence in Brussels took place on June 12th 2013, where we showcased our latest range of Cashmere, Lambs wool and Alpaca items. Welcome to the Winter 2012 Newsletter from Panchachuli U.K. As we look forward to another season, we’d also like to take this opportunity to tell you about some of the exciting developments that have taken place over the summer. In June 2012 our annual visit to the Panchachuli weaving co-operative in Almora took place and this year was especially exciting as we took the design team from Timberland UK with us, and representatives from NEST, who helped to co-ordinate the trip. We spent a great few days travelling up to the mountains from Delhi and working with the Master weavers and the team, to come up with some truly beautiful new designs for AW 2013. We can’t wait to show you these and the new photos and video that were taken on the trip….coming soon! But here’s other news for now…. This summer our ladies have been very busy embroidering a beautiful range of stoles for Livia Firth at Eco Age which are now available to buy at Yoox.com. This is Livia Firths first collection and we are absolutely delighted to have been chosen for this exciting project. We are also thrilled for Livia as she has been chosen as a UN Leader of Change 2012 for her amazing work with the Green Carpet Challenge. Well done Livia! We are also thrilled for fashion designer Carrie Parry who has won The Green Award at Amsterdam Fashion Week in January 2012, and in Nov 2012 the Eileen Fisher Business Women Award. Carrie has made an impressive mark on the fashion scene in the U.S.A and many of her designs feature Panchachuli Lambs wool fabrics. More of Carrie’s designs can be viewed on our Panchachuli U.K. Facebook page. our new facebook PAGE – IS LOOKING GREAT WITH LOTS OF COLOURFUL PHOTOS AND THE LATEST INFORMATION. PLEASE CHECK IT OUT. We would be delighted if you ‘like’ our Facebook page to keep updated. 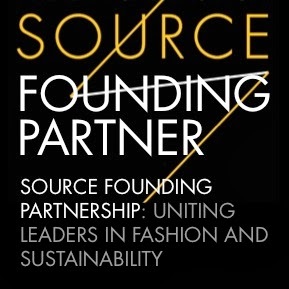 SOURCE4STYLE - The Sustainable Fabrics Directory launched in November 2010 and has been very well received. September 2011 saw the re-launch of a newer version of the website. 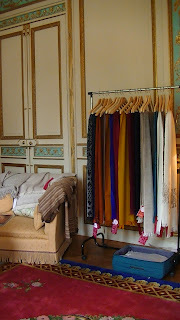 We are thrilled to have been at the launch of Pure Thread London! This October we were invited to take part in the launch of Pure Thread London. This event featured pop-up shops in Shoreditch and Carnaby Street, London and was great fun, as well as featuring exemplary ethical fashion brands. 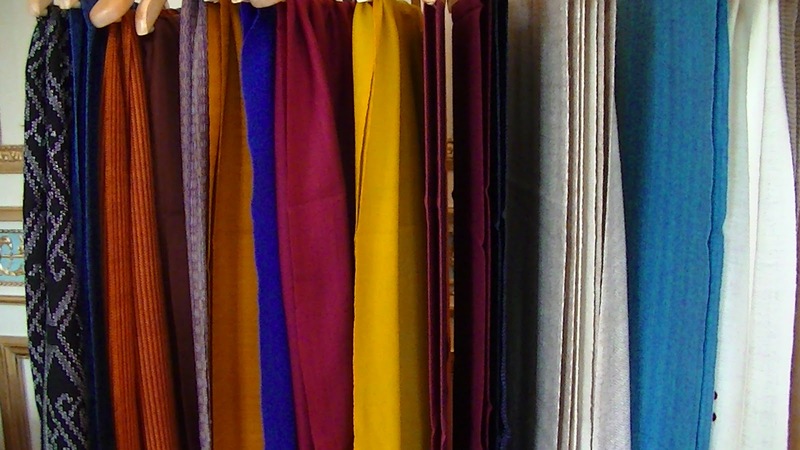 Coming soon…..The Panchachuli Autumn Winter Collection. 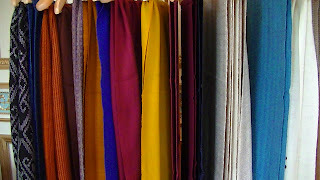 See our beautiful new Traditional hand woven and knotted STOLES AND SHAWLS in black, brown, blue and orange designs. These will be uploaded to the Panchachuli U.K. Store in time for Christmas. Fabulous! We are looking forward to lots more design work next year and are collaborating on some exciting new developments for 2013. There will be more news about this in the next Spring Newsletter. Over the next couple of months our production factory in India is moving to a new site and there will be updates about this as well. Thank you all once again for your continued support for the Panchachuli Women Weavers. It is very much appreciated by us all. On Dec 13th we will be taking part in the Urban Times Bid for Better event supporting the Environmental Justice Foundation. Press Release below - or details on Panchachuli UK Facebook page - if you’re in London and would like to take part. It promises to be a fantastic event! We will also be adding a few select items to our storefront on Facebook.